The dead (or sometimes deadbeat) seconds first appeared on clocks sometime in the 18th century, dividing the motion of the seconds hand into discrete jumps, making it easier to measure elapsed times. In clocks the gear for the seconds hand could often be linked directly to the escapement, thanks to a pendulum that swung with a one-second period. 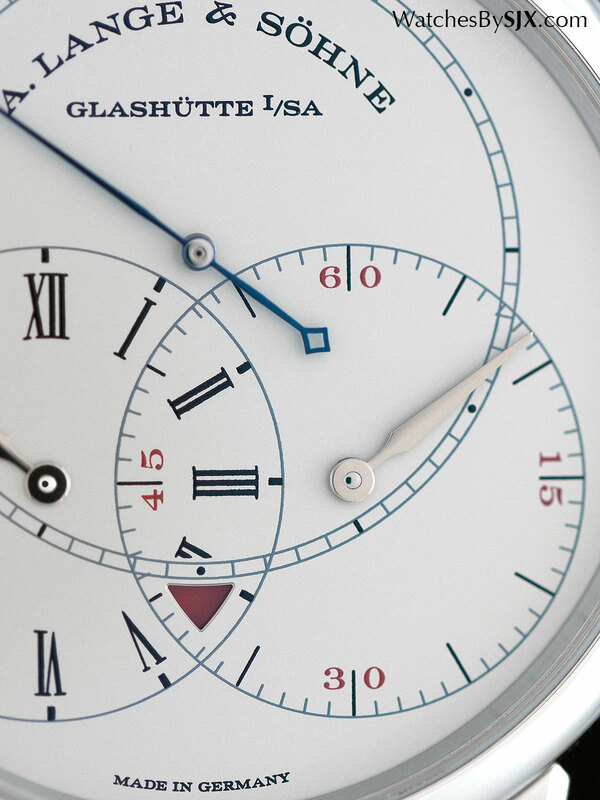 The invention of chronographs in the early 19th century provided a better solution for measuring elapsed time, but the independent seconds was still found in some pocket watches made for scientific measurements. A translation of the French term seconds morte, the dead seconds was revived (no pun intended) for a brief spell in the 1950s when such wristwatches were fashionable. They were marketed as ideal for doctors and engineers to measure short periods of time; Omega introduced the Synchrobeat in 1954, with Rolex debuting the Tru-Beat the same year. 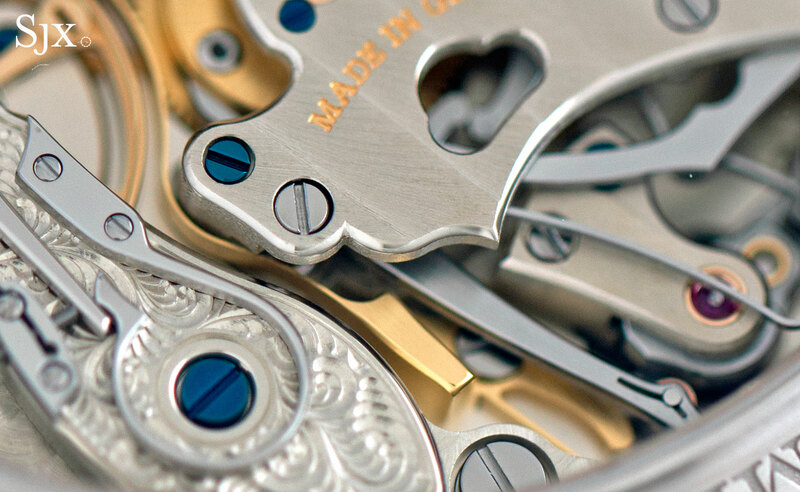 Movement maker also produced a family of movements (the calibres 115, 116 and 7400) with a dead seconds feature, that it supplied to several brands, most notably Doxa. None of these sold well, and the dead seconds fad, well, died before the decade was up. These early deadbeat seconds wristwatches required additional gearing for the ticking seconds, so as to convert the oscillations of the balance wheel (eight ticks per second in a 28,800bph watch) into one-second steps. 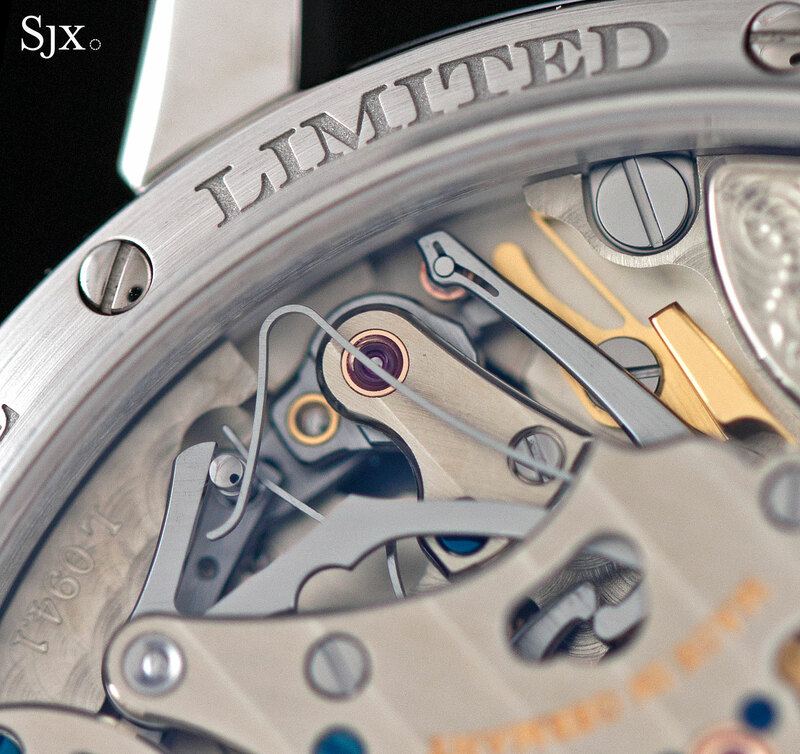 This is the same set-up found in most contemporary dead seconds wristwatches, including the Jaeger-LeCoultre True Second, as well as the offerings from Arnold & Son, Habring2 and Jaquet Droz. Because these movements need extra mechanics for the jumping seconds, they are not “natural” dead seconds as known in watchmaking parlance. Movements with dead seconds that are a consequence of an intrinsic function of the movement are natural dead seconds. Examples of such watches include the F.P. Journe Tourbillon Souverain and Chronometre Optimum, both of which have escapements that operate such that the seconds hand naturally moves in one second intervals thanks to a constant force mechanism. 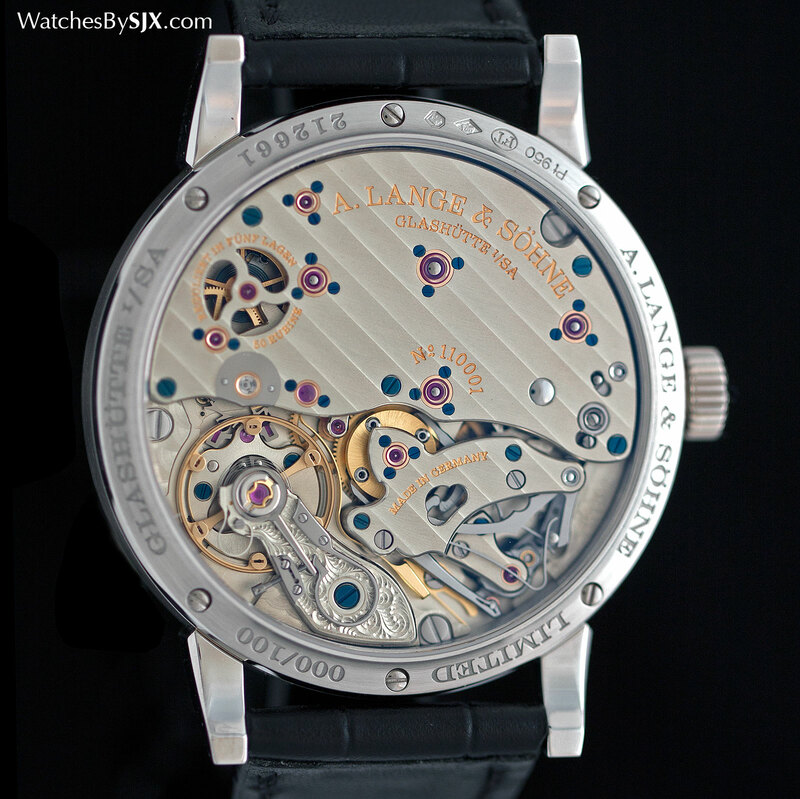 One of the highlights of the 2016 line-up from A. Lange & Söhne, the Richard Lange Jumping Seconds, has a constant force mechanism, but is not a natural dead seconds. 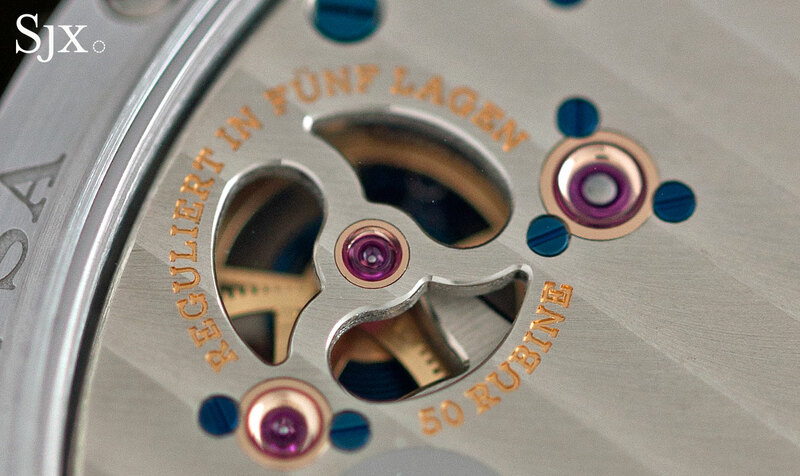 Visible through an aperture on the main bridge, the constant force mechanism has a small blued steel spring that releases power from the mainspring in one-second intervals, ensuring the power driving the movement is constant even as the mainspring winds down. 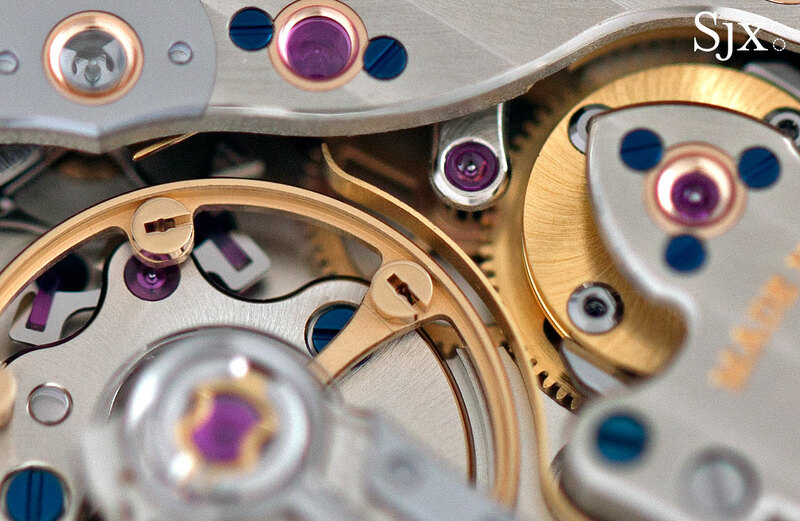 The L094.1 movement has two gear trains: the constant force mechanism is part of one gear train that delivers power to the balance wheel, while the other gear train is for the dead seconds. 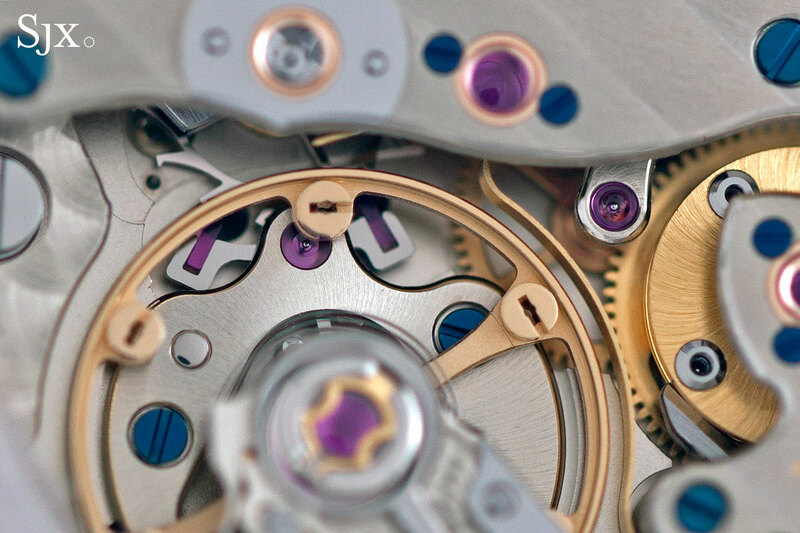 The second gear train, which includes a five-pointed star visible underneath a small sapphire lens, translates the motion of the balance wheel into the one second steps of the seconds hand. Both gear trains are linked by a slim lever touching the five-pointed star that controls the release of energy to the deadbeat seconds. One advantage of the constant force mechanism, besides ensuring consistent torque even when the barrel winds down, is to do the same each time the seconds hand requires an impulse to tick. Besides the constant force and jumping seconds, another unusual feature is the zero-reset hack seconds. 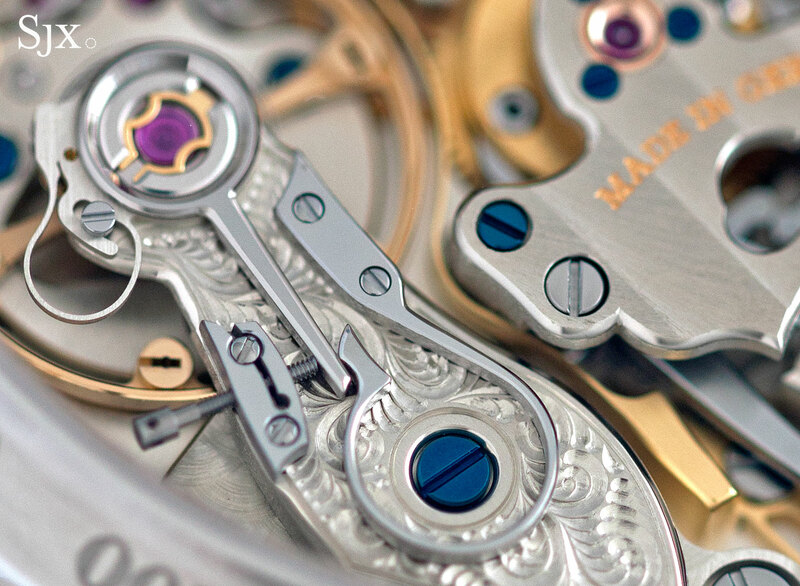 Pulling the crown stops the seconds hand and sends it back to 12 o’clock, in order to aid time-setting. 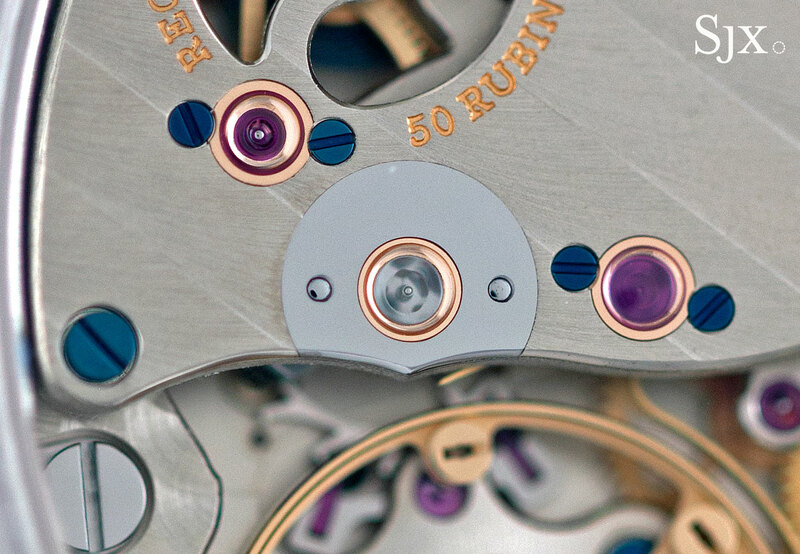 Though a simple feature, the reset seconds requires a significant amount of mechanics, resulting into the somewhat untidy looking cluster of levers and springs beside the balance wheel. For this reason, the movement, while gorgeously decorated and impressive looking, is not beautiful. The seconds reset mechanism looks unkempt, partially sheltered under an irregularly shaped bridge. The bridge for the seconds reset mechanism is beautifully finished, despite its odd shape. The long curved lever that stops the balance when the crown is pulled. The last feature of the Richard Lange Jumping Seconds is the power reserve display, or more specifically, the low power reserve indicator. A triangular window at six o’clock on the dial turns red once the mainspring is down to its final 10 hours of power reserve (fully wound it’ll run for 42 hours). This is meant to remind the wearer that the watch needs rewinding, but it does not imply deterioration timekeeping as in an ordinary movement, thanks to the constant force mechanism. All the functions of the Jumping Seconds make a lot of sense when combined together, since each is conceived to make timekeeping and setting more precise; the whole is greater than the sum of the parts. 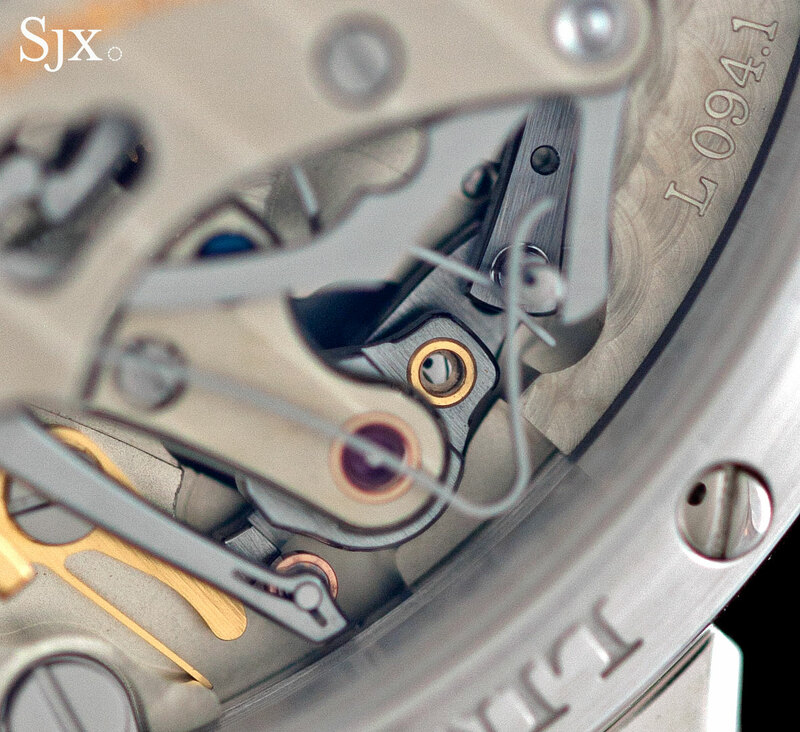 Unlike most other contemporary dead seconds watches this is more than just extra gearing for the aesthetics of a jumping seconds hand. But at the same time, the Jumping Seconds is not as intellectually pure as a natural dead seconds, since it has extra mechanics solely to achieve a ticking seconds hand. Its validity is premised on the fact that a dead seconds is useful or desirable, requiring a constant force mechanism to keep torque level even with the ticking seconds. There is some circularity in the logic. 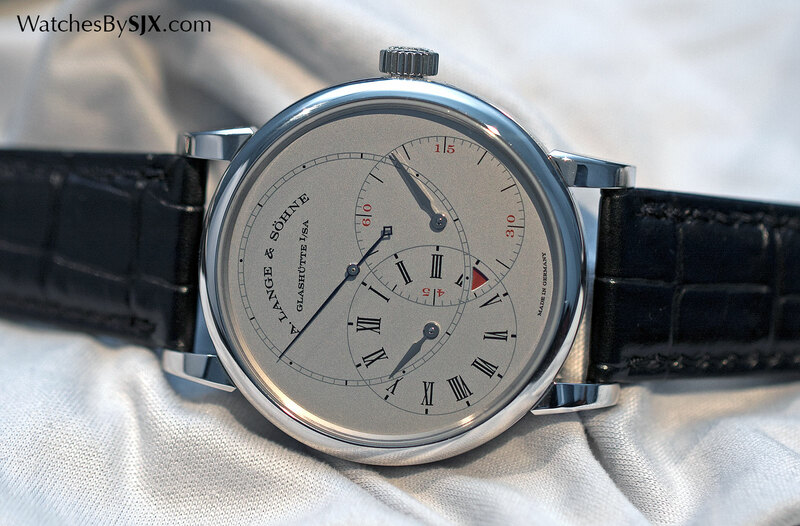 The Richard Lange Jumping Seconds is styled after a pocket watch made by Dresden watchmaker Johann Heinrich Seyffert, which had an unusual regulator dial with three-overlapping sub-dials. 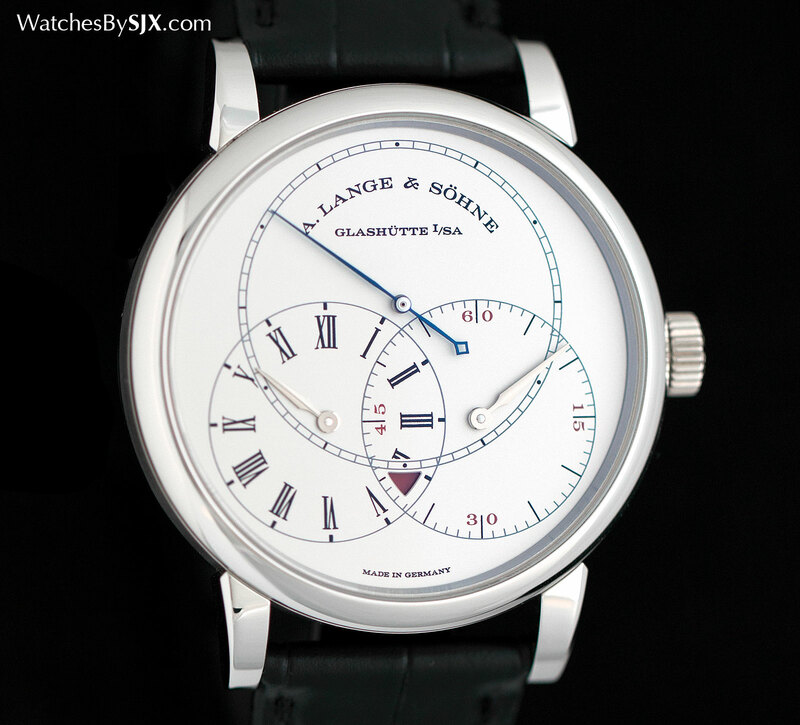 Lange used the same dial layout for earlier watches like the Richard Lange Tourbillon Pour le Mérite, but on the jumping seconds the seconds sub-dial is enlarged and positioned at 12 o’clock, highlighting the key feature of the movement. Though the dial appears monochromatic from a distance, it actually has a more nuanced colour scheme. The tracks for each sub-dial are a pale blue, a shade lighter than the blued steel seconds hand, while the lettering and markers are black. And there’s a splash of red on the minutes sub-dial. It’s a pleasing look enhanced by the size of the case – 39.9mm in diameter and 10.6mm high – large enough to be sizeable but not being clumsy. The platinum case also gives it added heft. Though it feels solid, the Jumping Seconds is unlike most other current Lange complications, which tend to the enormous side of large. The Richard Lange Jumping Seconds is a limited edition of 100 pieces in platinum, though it is exceedingly likely other variations (rose gold or Handwerkskunst editions) will be introduced later on. It’s priced at €78,700 including 19 percent European tax, and expected to reach stores in October 2016.